KENNEDY SPACE CENTER, FL--With commander Mark Kelly at the controls, the shuttle Endeavour caught up with the International Space Station early Wednesday, looping under and then ahead of the lab complex before gliding back to a "silky smooth" docking at the station's forward port at 6:14 a.m. EDT (GMT-4). "Houston and station, capture's confirmed," pilot Gregory Johnson radioed as the two spacecraft sailed through orbital darkness 220 miles above the south Pacific Ocean. Inside the space station, European Space Agency astronaut Paolo Nespoli rang the ship's bell in a traditional naval welcome, announcing "Endeavour, arriving." As usual with shuttle-station linkups, it took most of an orbit to lock the two spacecraft together and complete leak checks before hatches were opened around 7:38 a.m.
Kelly, Johnson, Andrew Feustel, Michael Fincke, Gregory Chamitoff, and European Space Agency astronaut Roberto Vittori floated into the station's Harmony module at 8:10 a.m., welcomed aboard by Expedition 27 commander Dmitry Kondratyev and his five crewmates, Andrey Borisenko, Alexander Samokutyaev, Ronald Garan, Catherine Coleman and Nespoli. "It's good to be back," said Kelly, who last visited the station in June 2008. Live television from inside the Harmony module showed the two crews hugging and shaking hands amid smiles and laughter. A few minutes later, they split up for a required safety briefing to familiarize the shuttle fliers with emergency procedures aboard the station. "The entire rendezvous, approach, RPM (rendezvous pitch maneuver) and final docking was really silky smooth today, we had no anomalies to work, no problems whatsoever, everything went really, really well," said shuttle Flight Director Gary Horlacher. Kelly's wife, Arizona Rep. Gabrielle Giffords, who was shot in the head in an assassination attempt last January, was expected to undergo surgery Wednesday in Houston to replace a section of her skull that was removed earlier. Giffords flew to Florida last weekend to watch Endeavour's launch Monday and her recovery has been the focus of intense media interest. Horlacher said he did not know any details about Giffords' medical treatment, but he said it had not affected Kelly's performance in orbit. "If you didn't know any of that was going on, you wouldn't have any idea that those kind of things are going on in his personal life," Horlacher said. "He's doing great. As far as that actual medical activity, I don't have any details on that. I know the surgeons are keeping him informed appropriately." The combined crews faced a long day of work transferring spacesuits and other equipment from Endeavour to the station and using both vehicles' robot arms to move a massive pallet of spare components from the shuttle's cargo bay to an attachment point on the left side of the station's power truss. The shuttle's other primary payload, the $2 billion Alpha Magnetic Spectrometer cosmic ray detector, will be attached to the right side of the truss on Thursday. The terminal phase of today's rendezvous began with a 10-second rocket firing at 3:37 a.m. to begin closing the final 9.8 mies between the shuttle and the space station. Catching up from behind, Kelly paused the approach 600 feet directly below the space station and carried out a computer-assisted 360-degree back-flip maneuver to expose heat shield tiles on the belly of the orbiter to the lab crew. Nespoli and Coleman, working in the Russian Zvezda command module, photographed the shuttle with powerful telephoto lenses to help engineers complete an on-going assessment of the shuttle's heat shield. Television cameras aboard the station captured the initial moments of the rendezvous pitch maneuver, or RPM, but the satellite link dropped out due to the lab's orientation and the rest of the maneuver went unseen on live television. Video was downlinked later showing spectacular views of the full rotation. With the rendezvous pitch maneuver complete, Kelly guided Endeavour up to a point about 300 feet directly in front of the space station with the orbiter's nose pointed toward deep space and its payload bay toward the station. Working from Endeavour's aft flight deck, he deftly guided the orbiter to a picture-perfect docking at the space station's forward port to cap a two-day rendezvous that began Monday with liftoff from the Kennedy Space Center. Throughout the final stages of today's approach, Feustel monitored navigation sensors and software designed for NASA's post-shuttle Orion exploration capsule to help engineers calibrate the system and characterize its performance. After undocking May 29, the new system, known by the acronym STORRM, will be put to the test during a re-rendezvous exercise to verify its performance in real-world conditions. "They had a really good day," Horlacher said. "They had all their systems up, collected data all the way in to the final docking. ... The STORRM folks will be pulling data down for the next few days from their avionics box and be all set up for the undock several days down the road." In the midst of a busy first few days of docked activity, three of the station's crew members -- Coleman, Nespoli and Kondratyev -- will be gearing up to undock and return to Earth Monday aboard the Soyuz TMA-20 ferry craft. Because the departing crew members need to adjust their sleep cycle to synch up with the landing day timeline -- and because of a two-week launch delay for the Endeavour astronauts -- the two crews are working in staggered shifts. 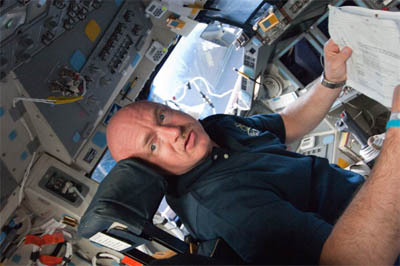 Garan, assisting the shuttle crew during the early portion of the docked flight, will go to bed at 2:26 p.m., followed a half hour later by Kelly and his crewmates. The station crew plans to go to bed at 5:31 p.m. After the Soyuz TMA-20 departure, the remaining station crew members will adjust their sleep cycles to synch up with the shuttle crew.